The Strength Ball Training continuing education course presents assessments; exercises; programs for injury prevention, mobility, conditioning, strength, and special populations; and access to online video demonstrations and full-length programs. Select and implement proper assessment techniques to identify areas for improvement. Describe proper strength ball exercise technique using step-by-step instructions. Determine appropriate strength ball exercises for each body part. Explain whole-body primal moves and agility drills that increase strength, mobility, balance, and movement skills. Demonstrate proper stretching technique to enhance full-body flexibility and mobility. Describe the rationale for program development using the strength ball. Preferred by elite athletes, fitness experts, and strength and conditioning specialists, stability and medicine ball exercises are essential to developing core power, strength, balance, increased reaction time, coordination, and stability. 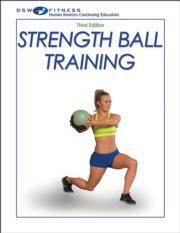 The Strength Ball Training, Third Edition, course presents those exercises along with instruction in developing resistance training programs that deliver results. Whether you are a fitness enthusiast, coach, personal trainer, or physical therapist, Strength Ball Training offers you simple assessments to identify the current fitness levels and appropriate starting points of your clients. You can then follow the exercise progressions and modifications to customize each exercise to fit client needs. Many of the exercises incorporate additional types of equipment such as dumbbells, cables, barbells, strength bands, and balance boards. Access to an online library of video demonstrations of complex exercises helps simplify their instruction. This course also offers complete programs for injury prevention, mobility, conditioning, strength, and special populations such as youth. These programs can be used alone or sequenced for longer, more challenging workouts. The study guide includes a course syllabus, learning objectives, learning activities, and referenced answer key. The study guide emphasizes key concepts of the book and video content to prepare individuals to pass the 50-question exam composed of multiple-choice and true-or-false questions at the completion of the course. Based on the book of the same name from Lorne Goldenberg and Peter Twist, two of the most respected names in the strength and conditioning industry, the Strength Ball Training CE Course is what strength and conditioning professionals need to enable clients to strengthen their athletic performance. Goldenberg earned an honors degree in physical education from the University of Ottawa and is certified by the National Strength and Conditioning Association as a strength and conditioning specialist. He is also a certified exercise physiologist (CEP) through the Canadian Society for Exercise Physiology. Goldenberg has published numerous articles in journals and magazines, including Men’s Journal, Physical, and Ironman. At conferences he has presented for organizations such as the National Strength and Conditioning Coaches Association, IDEA Health & Fitness Association, CanFitPro, American Fitness Professionals & Associates, Perform Better, Twist Conditioning, Yale University, and Dalhousie University. Twist has coached more than 700 professional athletes, including Hakeem Olajuwon, Mark Messier, and Justin Morneau, and was the NHL conditioning coach and exercise physiologist for the Vancouver Canucks (1994 Stanley Cup finalist) for 11 years. An NSCA-certified strength and conditioning specialist and CanFitPro personal training specialist with a master's degree in coaching science from the University of British Columbia, Twist was president of the Hockey Conditioning Coaches Association, editor of the Journal of Hockey Conditioning, and NSCA provincial director for British Columbia. Twist and his team have been selected by the Chinese Olympic Committee to lead the performance training and rehabilitation for the Chinese team in upcoming summer and winter Olympics. He will work with athletes competing in the Rio 2016 Olympics, the 2017 China National Games, and the PyeongChang 2018 Olympics and will offer long-term athlete development programs aimed at the Beijing 2022 Olympics. Twist has authored 10 books, 16 DVDs, and more than 400 articles on sport-specific conditioning. A CanFitPro Specialty Presenter of the Year and recipient of the Business Excellence Award as Business Person of the Year, Twist earned the 2013 IDEA World Fitness Inspiration Award for his example of living life to the fullest.